Our newest cabin for 2016. Our "Creek Side Cabin" is situated within feet of both our beautiful well stocked (catch and release) lake and the spring fed creek that flows through the property. The Creek Side cabin is a one bedroom with beautiful vaulted ceilings. It is easy step free access. After a day of fishing, strolling around the lake, or reading a great book, you will find the kitchen is well suited to prepare food from snacks to full family dinners. Or you might choose to grill on the provided gas grill. Then enjoy coffee or desert relaxing on either porch, take in the lake view or the relaxing countryside creek view. Included with the cabin there is a two-person boat. You can enjoy the great fishing in our catch and release lake or just float along and enjoy the beautiful sights of nature! As evening comes build a fire in the stone fire pit. Enjoy the stars, some mores, roasting marshmallows, or snuggling seem to be popular! Peaceful Valley is located out in the country, providing a great place to unwind, relax and recharge. Yet we are conveniently located minutes from Russell Springs, Jamestown, and the beautiful Lake Cumberland! Please visit and enjoy what some of the our guests call "a little piece of Heaven" Peaceful Valley. This is a large bathroom. Towels, hand towel, body soap, hand soap, tissue paper is all provided for our guest. The cabin has a gas fire for those cold winter nights. All of the bedroom and bathroom linens are provided for our guest. We have a May Tag top load washer for our guest to use. There is also laundry detergent provided. We have a May Tag dryer for our guest to use. Towels, hand towels, wash clothes are all provided for our guest use. There is provided for our guest dishes, cooking utensils, and eating utensils. Even dish liquid, dish towels, and also paper towels. Lots of room for the kids to run and play or for just taking a stroll. We provide a two person trolley motor fishing boat for our guest own use. Beautiful Lake Cumberland is also located about 25 minutes from us for those who enjoy spending time on the lake. Two very comfortable and inviting porches to relax and enjoy yourselves. We have a tennis court located about 15 minutes from the cabin. There is a very nice golf course located about 10 minutes from the cabin. Great stay with the Antle's on their farm! My wife and I needed a weekend to unwind and this place is located within an hour and a half from our home. We were close enough to home to get back in a hurry if our elderly parents had an emergency, but, were far enough away to be inaccessible to people from our jobs. It was a just a nice getaway to go rest, unwind and dip a line in an easy access pond and stay in a nice cabin. The Antle's have set up a nice little retreat on their family farm with a well stocked catch and release pond. I landed a five pound or so catfish and a three pound bass on one day with a whole lot of hybrid blue gill and bream in between. The cabins that front the pond (three of them) are about as nicely stocked up as the pond is with whatever a person might need for a stay. Having stayed with VRBO/HomeAway rentals many times before, on the beach, a lake or even a trout river, we were very impressed with how well the cabin was furnished with all the needs and extras that make a stay successful. Rose Antle had even prepared some "short" cakes for us as visitors when we arrived for a welcome that were VERY good! We met Tim a few times and he is down home and courteous as people come. We saw Rose a few times and she seemed busy as a bird dog on point cleaning cabins for future guests but we never got to talk to her. The place is kept as neat as possible inside as well as the grounds outside that a person could want. For a nice retreat, if you like to fish, you can't beat this place! My wife and I intend to go back in September if our schedule will allow it for some fall fishing and another retreat from the worries of home. Thank you Tim and Rose and sons! What a beautiful place to get away and relax. My husband and I really enjoyed ourselves, fishing, cooking, fire pit, EVERYTHING! Thank you so much Elizabeth. It was truly a pleasure having you as our guest. Such a beautiful relaxing place close to all kinds of activities if u even feel need leave. We didnt . We enjoyed sitting on porch fishing in boat provided. Has everything you need laundry cooking fridge stove comfy bed grill and so much more. Fishing is great! They like live bait ( night crawlers/crawdads) or a jig...the channel cat are huge, alot of fun to catch and we caught several nice bass. Timmy and rose are extremely hospitable and sweet and really go above and beyond to make your stay perfectly complete. The maintenance of the property is just gorgeous! You can tell they put alot of hard work and love into it. No weeds anywhere, landscaping is beautiful. Already planning another trip down. So many great things to say about this place and the amazing people running it. Thank you so much Stephanie. It is guest like your self that makes our property what it is. We appreciate your kindness and thoughtfulness. Timmy and I are so glad that you and your husband enjoyed your stay. My husband wanted to take me away for a "parents only" weekend to enjoy some us time and relax. This was not too far for us to travel but far enough away to escape the hustle of life. The cabin was ABSOLUTELY adorable, accommodating and no details were missed. The lake was gorgeous and full of fish. We enjoyed going around on the boat (even in 90+ temps) and fishing and then just sitting on the dock watching the water, wildlife and sunsets. Timmy & Rose are perfect hosts and even surprised us with a fresh cheesecake upon our arrival and a berry cobbler on our second night. They are very attentive and gracious. The cabin is fully stocked with anything you may need and that was an added bonus. We cannot wait to sneak away again for a visit and may even consider bringing the kids with us for a trip!!! Thank you Patty, we are so tickled that you had a nice "parents only" time. Timmy and I really appreciates you both for choosing to stay at our property and for taking the time to post such a wonderful review. We would be honored to have you bring your kids with you. Timmy and I look forward to your next stay. Take care and God bless. Timmy & Rose go above and beyond with this cabin. My wife (Penny) & I enjoyed our stay so very much. The cabin (Creekside) and the lake are so very nice. We enjoyed Timmy stopping by and just sitting and talking. He knows a lot of the same people from Mercer County as us due to him being in the farming business. And,,,, Rose,,,, The Dessert you left for us was "Outstanding". We will be back and will be highly recommending your place to all our friends. Thank you Jackie and Penny so very much for such a kind review. Timmy enjoyed his visit with you as well. It is our wish that all of our guest feels welcomed and appreciated. Cause we really do appreciate each and everyone of our guest. We look so very forward to seeing you again. Take care and God bless you both. My husband and I loved everything about Creekside Cabin. Everything we needed was furnished and stocked. Rose's welcome Dessert was absolutely delicious and the perfect snack to come home to. The lake was so peaceful and the boat was a lot of fun. Thank you for a relaxing getaway for my husband and I. We will be back! Thank you Erinn so much. Timmy and I are absolutely thrilled that you enjoyed your stay. It was certainly a pleasure to have had you as our guest. We look forward to your next visit. Take care and have a wonderful Fall. Peaceful Valley Lake and Cabins is located in beautiful Russell Springs, Kentucky just minutes from the State Dock in Jamestown, and Lake Cumberland State Park. Don't miss a trip to the Wolf Creek National Hatchery or head to the near by town Nancy to visit the historical Mill Springs Civil war Battlefield and pickup a delicious homemade apple pie from Haney's Apple Orchard. 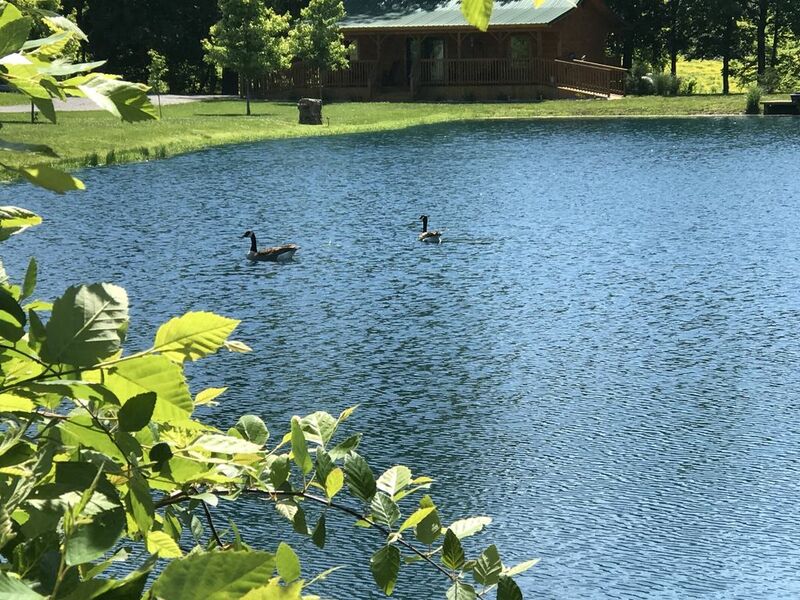 So many things to see and do near us, but we have a feeling you won't want to leave the cabins, which include a private catch - release lake for your own fishing and boating pleasure.